Being the gracious middle-child, Jasmine was built in December 2007 in the style of a traditional Vietnamese junk, with three tawny sails and dark wood-cladding. With 23 cabins, Jasmine is the biggest sister in the family with 12 Superior cabins (17m2, window), 09 Deluxe cabins (18m2, small balcony of 2m2) and 02 Jasmine Junior Suites (24m2, small balcony of 2m2). This elegance child is covered in polished wood, lending her the stately air of an Indochina-era cruising boat. Guests can convene in the formal dining room, enjoy casual barbecues on the terrace and marvel at the bay’s moonlit beauty on the Jasmine’s wide Sundeck. The décor is classy – with marvelous wooden finishing. Pleasing paintings and well designed amenities decorate this room. 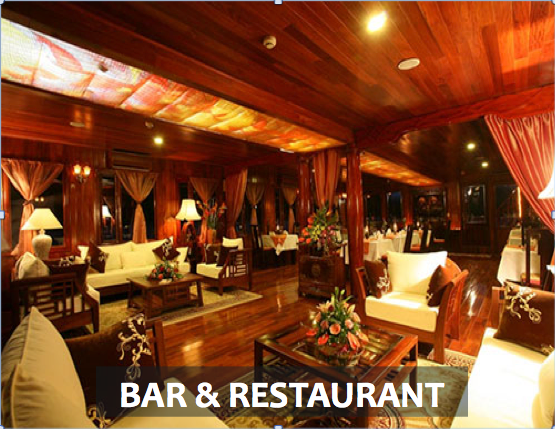 A small lounge with a bar sits next to the restaurant area where fine cuisine with set menu for dinner is served. With the same high quality & great quantity of food as all products of Heritage Lines, the outstanding meal on-board the Jasmine should be the BBQ dinner with various food to be served to your table. We confidently rate this cruise as Upscale Deluxe or Luxury category, a very well-organized junk on which gives guests a lovely view of the Bay from above. Sturdy and strong – with a decidedly languid air, let Jasmine transport you around our Halong World Heritage! Dragon people therefore are supposed to be born talented however arrogant and tactless. As placed at the position of king, their image are associated with at royal places such as palace and on king’s robe. It is said that dragon person never live poorly but would be wealthy or at least well-to-do. However, it is also said if a dragon one can balance between big things and small affairs, their life would be perfect. Vietnam wet climate is definitely a prime land for snake to live. 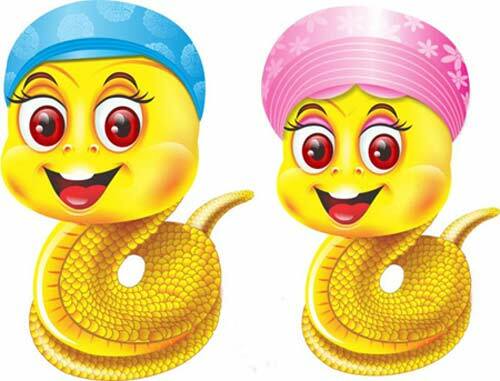 The interaction between snake and human and snake use for medicine have put snake in the important place of an animal that symbolizes a great part of Vietnam culture. While snake always appears dangerously, its venom and skin are very useful in medicine. Don’t you be surprised to see a snake person so lucky! That’s one of the most prominent features of snake sign. On the other hand, a snake one is extremely charming: once you are caught in love with a snake girl, you can hardly escape the relationship. Halong bay, a major tourist attraction in Vietnam, proudly to be recognized twice by UNESCO as a World Natural Heritage Area for its exceptional scenic beauty and one of the world’s greatest natural wonders. As the sun rises over the thousands of karst islands that dot Halong Bay, the three stunning crafts, the “Three Sisters” vessels elegantly welcomes guests on an intimate journey through one of nature’s true marvels. They are Ginger, Jasmine and Violet – the true masterpieces belong to Heritage Line. 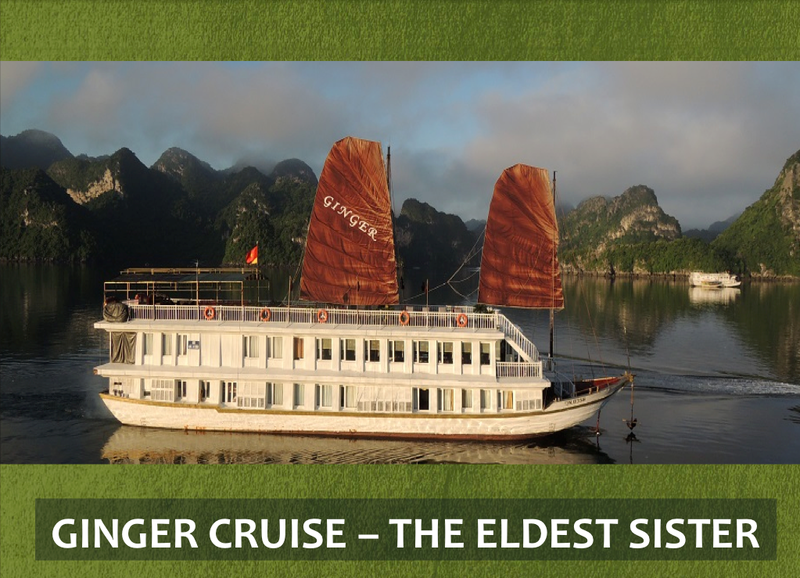 Built in March 2006 to resemble a traditional wooden junk, the Ginger features wood-paneled lounges, shimmering silks and Indochine-style furnishings. Simple yet elegant, the cabins feature large windows – perfect for viewing the Bay’s ever-changing scenery. 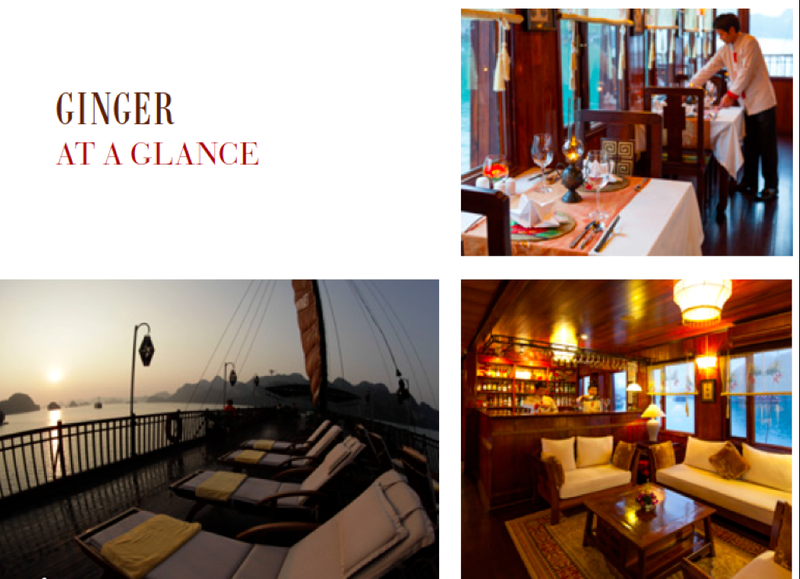 With only ten cabins, divided into 2 categories – Superior (12m2) and Deluxe (14m2), the Ginger offers an intimate means of exploring Halong Bay. The wooden floor and ceiling create a warm ambience of the rooms. Large windows offer a spectacular view to the Bay. We think this cruise serves best for couple, in a romantic and relaxing way. There are two major interesting activities on the 1st day, which are cave visiting and kayak/ rowing boat which do not feel rush at all. Besides those, you have plenty of time to lounge on the sundeck or in your cabin, to take in the breath-taking scenery of this gorgeous bay. 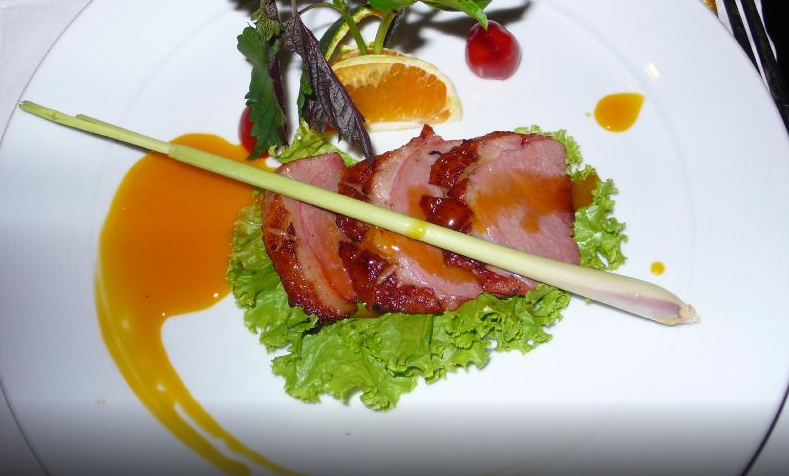 Savor delectable cuisine at the cozy restaurant. The warm color tone, coupled with candle-light and panoramic windows will certainly ensure that your meals are memorable experiences. Food on this cruise is just to die for, of excellent quality and quantity. 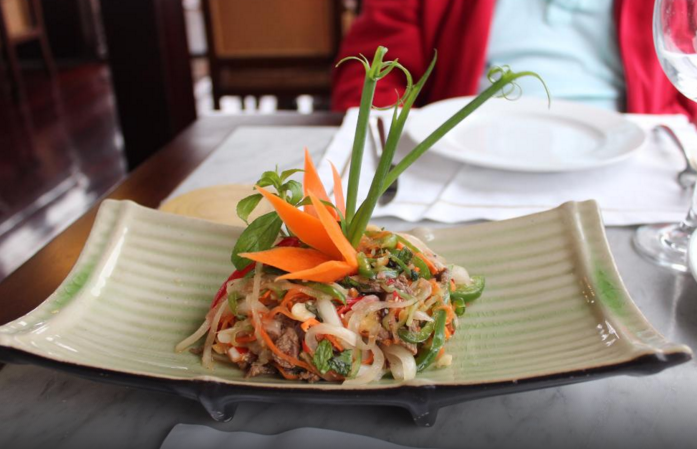 Food varies from a buffet lunch with delicious Vietnamese salads to a lovely à la carte dinner in lovely decoration – everything tastes just more than good! This cruise is rated in our Deluxe category, a solid choice for travelers who want to stay in a not so big junk, with excellent service, efficient organization of activities, good facilities & amenities, plus excellent food. We confidently trust Ginger junk will bring you an amazing experience and well worth the money spent! Are you looking for an ideal spa in Siem Reap? Are you looking for an ideal place for relaxing and enjoying in the uplifting moments spa in Siem Reap? In Khmer, Sokkhak means ‘tranquility’. They are using the combination of nature inspired décor with a soft, warm and tranquil atmosphere to relax, refresh and indulge our clients. we have carefully chosen products containing botanical and marine home-made ingredients with nature’s very own powerful herbs, to give the skin a vibrant and healthy glow and total body wellness. Don’t miss this place! Spa in Siem Reap has been created for your complete relaxation, where tranquility prevails throughout the exquisite, elegant. Opening hours: Tuesday – Sunday: 10am – 08pm. Last appointment at 07pm. Mondays closed. Add: No.24 Hup Guan Street, Siem Reap. Tel: +855 (0) 12 982 062or +855 (0) 63 964 391. Conceived as a sheltering cocoon and using organic products, Bodia Spa is an absolute sensory experience dedicated to pampering both body and soul in the most natural way possible. The concept of the spa is presented with modern Khmer architecture and also reflects the traditional well-being. The spa itself is a space of physical, mental and spiritual healing. The calming aspect of the healing reflects traditional, non – clinical and holistic based therapies. Home of massage in Siem Reap. The wonderful team is fully trained and professional, and it is our aim to offer. After visiting Angkor Watand other surrounding temples, what better way to relax and enjoy more Cambodian culture then by having a traditional massage, or feel reborn with our wonderful health and beauty treatments. At the budget end, there are many good massages in town in a simple, unadorned but clean and air-conditioned set up that perfectly meets the purpose for which it was established. They offer Khmer and oil massages, with a Khmer massage in a large, communal room with curtained off mattresses. Visit Sapa in winter, why not? 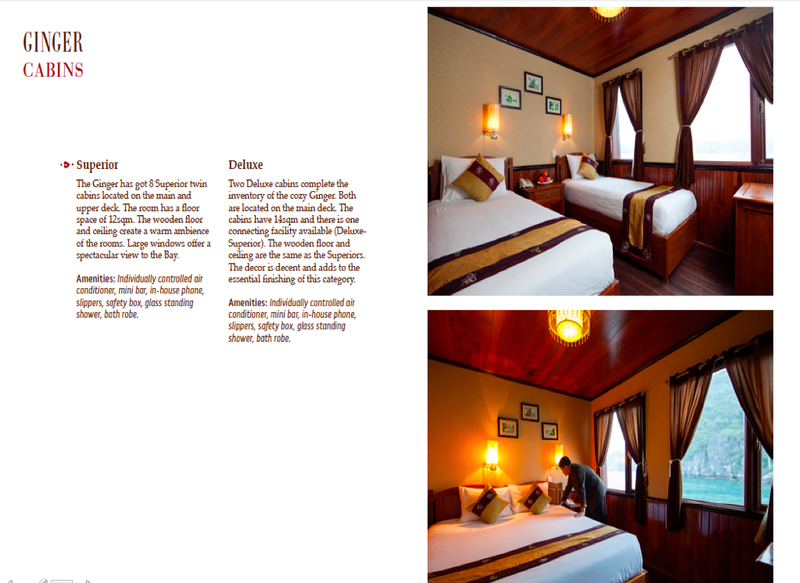 Come, experience and complete the list with your own reasons to visit Sapa in winter! I have seen hundred pictures about Angkor but when I get there, it’s still shock me with its marvelous. It’s beyond from pictures and since the first time I got there, I always try to come back. First of all, Angkor is not all about Angkor Wat. This is a huge complex and Angkor Wat is only one of many temples in there and it’s also one of the most famous one. I’m not trying to write details about these temples as it will take pages for one temples and I don’t have that much information. But, I will show you some of my photos and let the rest for you to find out when you get there. To visit all temples in this complex, it might take more than a week and we usually don’t have enough time so here is some must see temples that you don’t want to miss in one day visiting. Number 1 spot is always Angkor Wat, the centerpiece of any visit to the temples in Angkor. Angkor Wat is visually, architecturally and artistically breathtaking. It is a massive three-tiered pyramid crowned by five lotus-like towers rising from the ground. After years, some part of it is destroyed but this temple still well delivers a good taste from the past. The next temples in our list is Ta Prohm. Located deep in a jungle, this temple is well known for tree-in-temple because of massive fig and silk-cotton trees grow from the towers and corridors. These trees are perfectly blended with the sky, clouds, rock and damaged-temples to create an amazing looking. In Ta Prohm, there is a famous tree that everybody come here want to take a picture. And this tree is also on the big screen in the movie “Tomb Raider”. The last temple will be in my next post and make sure you don’t miss it as I will share some tips to get a good picture with less people in there.